Full-year 2017 catastrophe bond issuance reached a record at $12.56 billion, the first double-digit year, while catastrophe bond risk capital outstanding ended the period at a new all-time-high of $31.06 billion, according to our latest data from the Artemis Deal Directory & Dashboard. 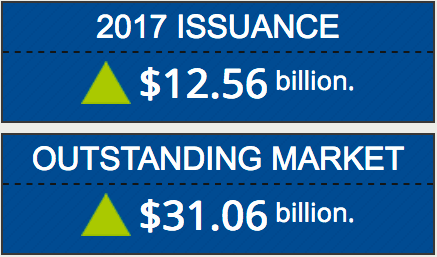 2017 cat bond issuance was always going to end the year on a high, after the second quarter saw a huge $7 billion plus of new issuance. 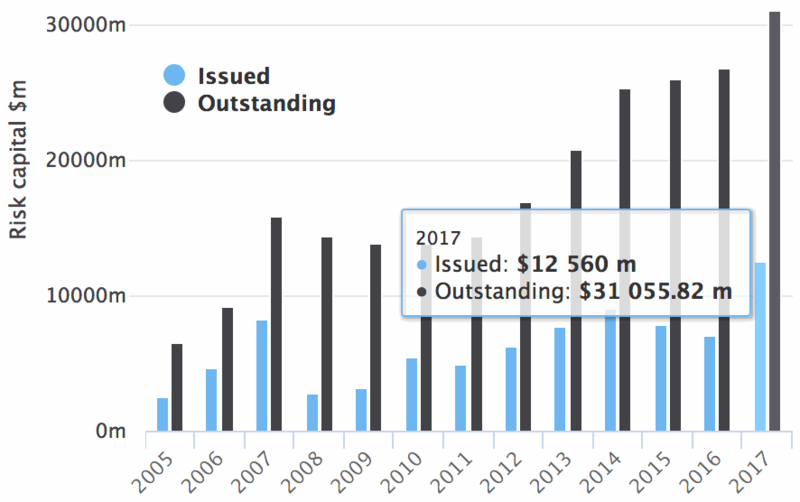 That one, particularly active quarter has helped to deliver the first double-digit billion cat bond market year, with record $12.56 billion of new risk capital issued over the twelve months from 62 new transactions, leaving total risk capital outstanding at a new high of over $31 billion for the first time. The completion of a $400 million Tailwind Re cat bond from Bermudian reinsurance firm Validus, as well as a flurry of private cat bonds issued at year-end, have taken the annual issuance total to a new high of $12.56 billion, which is a 78% increase on 2016 cat bond issuance of just slightly over $7 billion and 38% higher than the previous record, of just over $9 billion in 2014. The outstanding cat bond market has grown considerably in the last year, growing by a stunning $4.23 billion or 16% to reach a new all-time-high at $31.06 billion. The continued growth in issuance and the overall size of the cat bond market reflects the consistent increase in interest from investors in the ILS asset class, interest which has not been dampened by the recent catastrophe loss events. Catastrophe bonds feature in a growing number of multi-asset class investment funds, increasingly in mutual funds and other more broadly accessible fixed income investment strategies. This widening adoption of cat bonds and securitised ILS investment products is helping to drive further growth in the sector, not to mention the growing size of dedicated ILS fund strategies as well. At the same time as increasing investor interest, the insurance and reinsurance market has growing confidence in ILS and cat bonds as a risk transfer option, which has drawn new sponsors to the market and encouraged returning sponsors to increase the size of their capital markets deals. 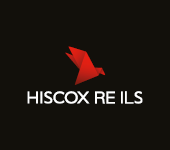 Nine of the 62 catastrophe bond transactions issued in 2017 and listed in our Deal Directory are from first-time sponsors, as a number of large and smaller companies looked to the cat bond market and securitised reinsurance or retrocession capacity for the first time last year. 62 transactions in 2017 was also the most active year ever, easily beating the previous most active year of 2015 when we listed and reported on 48 new cat bond transactions. This bodes well for 2018, as more first-time sponsors will be expected to come to market this year, especially as catastrophe bond pricing has proved relatively stable in the wake of the major catastrophe events of recent months. 2018 could be a fascinating year for the catastrophe bond market, as the pricing of recent transactions has shown that cat bond investors are willing to continue assuming these risks without enormous increases in interest spread after the major catastrophe loss events. Cat bond pricing may be at or near its most competitive, versus traditional reinsurance, which should help to stimulate further issuance and growth of the market throughout the coming year. You can now review fourth quarter and full-year 2017 issuance in our latest catastrophe bond market quarterly report which, published this morning. Note: Artemis’ data on catastrophe bond issuance includes every private transaction we can source information on, as well as full 144A broadly marketed issues. Hence our figures are usually higher than those quoted by broker reports, but we feel this provides a holistic look at market activity. As ever, you can analyse this market with Artemis, as we track the development of the catastrophe bond and insurance-linked securities (ILS) trade, with every transaction recorded in our Deal Directory, a Cat Bond Market Dashboard and our charts, data & analytics enabling users to analyse cat bond issuance and the market’s history more closely. Subscribe to our real-time email alerts in order to always keep up to date with the developing ILS and alternative reinsurance market.